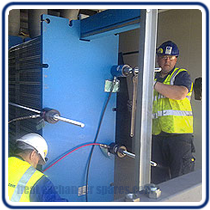 Our fully trained engineers have over 20 years experience servicing plate heat exchangers and are available to carry out work on all the leading brands of plate heat exchanger throughout the UK, and overseas if required. Our engineers carry the CSCS (Construction Skills Certificate Scheme) Skill card which qualifies them to carry out installation and service work for all the leading construction companies. The CSCS card provides evidence that the holder has undergone health and safety awareness training and testing. 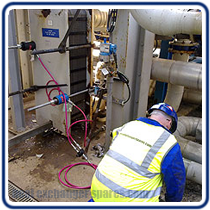 Along with the CSCS our engineers are also trained in first aid at work, confined spaces and have been security cleared at sensitive government buildings.